The Senate voted 50-48 Saturday afternoon to confirm D.C. Circuit Judge Brett Kavanaugh to the Supreme Court after a rancorous, protracted confirmation fight that ended with multiple allegations of sexual assault. The vote, which concluded just before 4 p.m. EDT, was almost entirely along party lines. Sen. Lisa Murkowski, R-Alaska, voted no but then changed her vote to “present” in deference to Sen. Steve Daines, R-Montana, who would have voted “yes” but was at the wedding of his daughter. Numerous anti-Kavanaugh protesters in the Senate gallery shouted out during the vote and were removed. Vice President Mike Pence, who was present in case of a tie, announced the result. Kavanaugh was to be sworn in later in the day, with a formal swearing-in ceremony expected Monday at the White House. President Donald Trump, who nominated Kavanaugh July 9 to fill the seat of Justice Anthony Kennedy, called the confirmation vote “very exciting” in a tweet. Senate Majority Leader Mitch McConnell, R-Ky., told reporters shortly after the vote that it was a great day for the American people and for the Senate. Despite the partisan rancor that threatened to sink Kavanaugh’s confirmation., Thomas Jipping, deputy director of the Edwin Meese III Center for Legal and Judicial Studies at The Heritage Foundation, said he thinks the new justice’s legacy on the court will not be one of politics. “Conflicts over judicial appointments are conflicts over judicial power,” said Jipping, who previously served as chief counsel to Sen. Orrin Hatch, R-Utah, on the Senate Judiciary Committee. Justice Kavanaugh will follow the law to his conclusion in each case, rather than manipulate the law to reach a desired result. Support or opposition to Justice Kavanaugh’s appointment, therefore, reflects whether America needs impartial or political judges. The liberty we enjoy in America is by design, including a limited, impartial role for unelected, life-tenured judges. Justice Kavanaugh is the kind of judge America, and our liberty, require. Congrats to Judge Kavanaugh and deep appreciation for Senators who supported him. Leader McConnell & Chairman Grassley showed outstanding leadership. Judge Kavanaugh has been tested by fire and proved himself to be everything we expected and more. He'll be another great justice. When President Donald Trump nominated Brett Kavanaugh, he understood that this seat on the nation’s highest court would be one of the most important decisions he made as president. Like Justice Neil Gorsuch, President Trump selected Justice Kavanaugh because he has shown through his long and distinguished tenure on the bench that he will be impartial, fair, and faithful to the Constitution. This is a good day for the American people and the rule of law. However, I am grieved that this long and painful process exposed the lack of civility and unity in America. As president of The Heritage Foundation, I am committed to finding solutions and bringing a broken America back together. 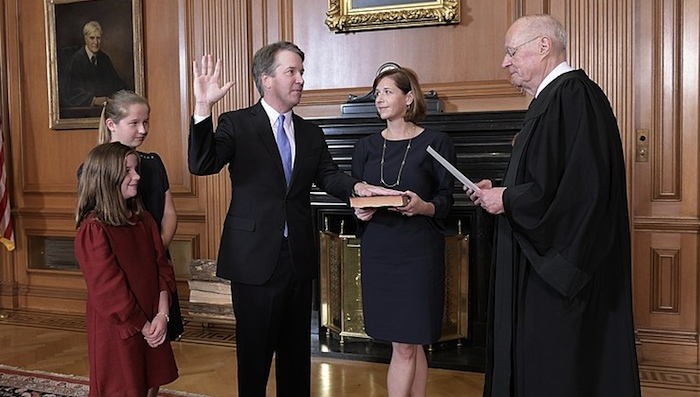 But today, I celebrate our newest justice, Brett Kavanaugh. Following Kavanaugh’s confirmation hearings before the Judiciary Committee, at least three women accused Kavanaugh of physical or sexual assault, the first accusation coming from research psychologist Christine Blasey Ford, 51. Ford told The Washington Post in a story published Sept. 16 that Kavanaugh, now 53, held her down, groped her, and tried to remove her clothes in a bedroom during a house party in the early 1980s in Montgomery County, Maryland, when they were both teenagers. The allegation forced the committee vote, originally scheduled for Sept. 20, to be postponed. Another woman, Deborah Ramirez, 53, who attended Yale University at the same time as Kavanaugh, accused him of exposing himself to her in front of others at a party. A third woman, Julie Swetnick, a 1980 graduate of Gaithersburg High School in Gaithersburg, Maryland, claims she saw Kavanaugh at a series of parties where young women were gang-raped. Kavanaugh forcefully denied the allegations prior to and during Sept. 27 testimony before the Judiciary Committee, saying he never sexually assaulted anyone. At the Senate committee’s request and at Trump’s instruction after the committee advanced his nomination the next day, the FBI conducted a supplemental investigation to look into the claims made by Ford and Ramirez, but found no corroborating evidence. That was Kavanaugh’s seventh FBI background investigation since 1993, conducted in connection with various positions he has held in the federal government. Sen. Chuck Grassley, R-Iowa, the committee’s chairman, said Friday in remarks on the Senate floor that Kavanaugh’s confirmation wouldn’t have been as political in years past. In announcing her support for Kavanaugh on Friday in a speech on the Senate floor, Sen. Susan Collins, R-Maine, said Kavanaugh’s confirmation process was far from the advise-and-consent procedure it should have been. “Today, we have come to the conclusion of a confirmation process that has become so dysfunctional it looks more like a caricature of a gutter-level political campaign than a solemn occasion,” Collins said. “Our Supreme Court confirmation process has been in steady decline for more than 30 years. One can only hope that the Kavanaugh nomination is where the process has finally hit rock bottom,” she added. Kavanaugh was nominated by Trump on July 9 to fill the seat of Justice Anthony Kennedy, who announced June 27 that he was retiring. The only nomination proceedings longer than Kavanaugh’s were those of Robert Bork in 1987 and Clarence Thomas in 1991. The Senate defeated Bork’s nomination, 58-42; it confirmed Thomas by a vote of 52-48 and he has served on the court since then. Ken McIntyre and Katrina Trinko contributed to this report. May God Bless & Protect America, Supreme Court Associate Justice Kavanaugh & his family, POTUS Trump and his family, and all Partriotic Constitutionalist, Conservative Americans including their families!! May God bring wisdom and the ability to think critically back to sheeple of the left being led off a cliff and don’t even know it!! To bad worn out corrupt do nothing loser Bernie and Leaky corrupt loser Leahy once again chose the losing side instead of the side of Patriots who wanted Kavanaugh and got him!